A hand-tied bouquet of peach roses, with peach ribbons streaming down, is simple and perfect. Matches our Peach Promise Boutonniere. 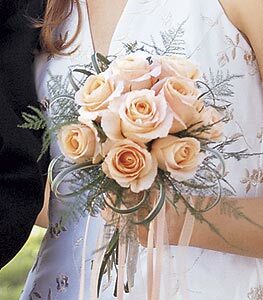 The bouquet features 50cm peach roses, variegated lily grass and plumosus, with yards of sheer and satin peach ribbon. Page loaded in 0.5613 seconds.